The first time they came to Hope Reins, Elvira couldn’t believe her eyes as Cheyanne’s demeanor transformed from a fidgety, nervous little girl to a calm, purposeful helper at the ranch. Do you know what it feels like to be the “awkward” kid? Bullied at an early age, she fell into depression after her parents’ separation. At school, her social anxiety manifested itself into goofiness, but rather than laugh with her, classmates laughed at her. Over the next four years that followed, Cheyanne’s anxiety diminished as her confidence grew – arriving home from sessions at the ranch with blistered hands and a huge smile. 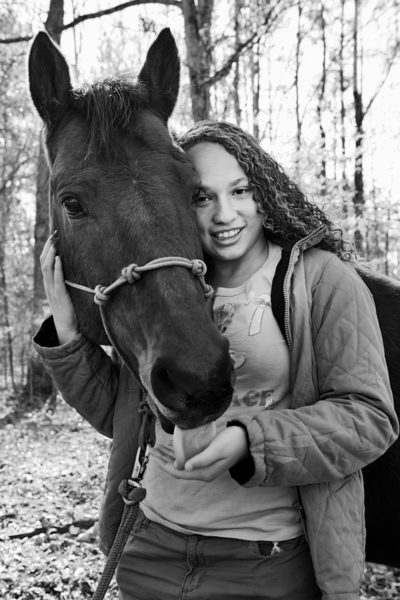 Last year, Cheyanne joined Hope Reins’ mentorship program called Bloom and graduated from high school. She’s also volunteering as a feeder. time to this important and safe haven. Bless You All. If ever I get to Raleigh North Carolina I will surely visit.. .